$373 billion−or $717 billion when adjusted for inflation. This cost is driven, in part, by the prevalence of aging eye diseases, such as AMD and other diseases that affect the retina. In the past 15 years, AMD treatment has progressed from few effective therapies to multiple options that prevent progression of advanced disease and even reverse vision loss for wet AMD. Featured speaker Mandeep Singh, M.D., Ph.D. will describe these developments as well as the focus of his work in developing a “retina in a dish” 3D stem cell culture that can serve as a donor source for photoreceptor transplantation. Mandeep Singh, M.D., Ph.D. is an Assistant Professor of Ophthalmology at the Wilmer Eye Institute. A retina specialist, Dr. Singh’s clinical expertise includes surgical, medical, and genetic conditions of the retina and macula. His research focus is retinal stem cell transplantation. Dr. Singh treats patients with genetic retinal diseases such as retinitis pigmentosa, Usher syndrome, Stargardt disease and macular dystrophies, and coordinates their care with the Johns Hopkins Institute of Genetic Medicine. His expertise also includes diabetic retinopathy, diabetic macular edema, retinal vein occlusion, and choroidal neovascularization. Since 2015, AEVR has held an annual Emerging Vision Scientists Day on Capitol Hill in which early-stage investigators attend the International AMD Awareness Week Congressional Briefing and exhibit posters of their breakthrough research at an evening reception (5:30 -7:30 pm in Rayburn 2168, the Gold Room). AEVR is proud to have Dr. Singh as the featured speaker at the AMD Briefing in 2017, as he participated as an EVS in the 2016 events. AEVR, a 501(c) 3 non-profit educational foundation, is hosting this widely attended event featuring an eye healthy luncheon held during International AMD Awareness Week and Healthy Aging Month. 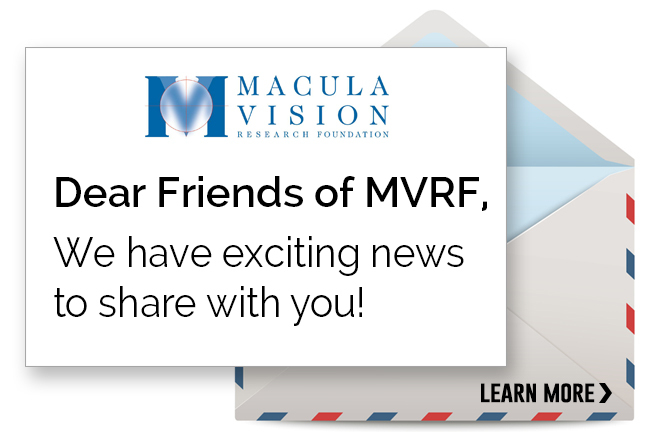 The Macula Vision Research Foundation (MVRF) is a 501 (c) 3 organization dedicated to finding a cure for macular degeneration and other retinal diseases. To reach this goal, MVRF funds groundbreaking research projects conducted by the world’s top scientists with the hope of improving the lives of millions of people affected by visual impairment. What makes MVRF unique is that 100% of every dollar donated goes directly to research. All administrative and fundraising expenses are underwritten by the Karen and Herb Lotman Foundation, allowing MVRF to allocate all donations towards finding a cure. Along with funding research, MVRF also provides education and outreach to those with visual impairments through our SupportSightSM educational seminars, newsletter and resources.